HANFORD – The Lindsay running program continues to reap the benefits of having their own track facility. Five Cardinal runners finished on the podium in six races during the East Sequoia League Meet in Hanford on Wednesday, March 13. The lone win for the Cardinals’ came by way of recent Div. I signee McKaylie Caesar. She clocked a time of 1:04.21 which blew away the competition in the second heat 400-meter. “I was just going out there trying to run strong, and focus on my form rather than compete against others,” Caesar said. Caesar’s form was tested immediately on the back stretch as she faced a stiff head wind. All she did was tighten up her form a bit by picking up her knees, and she was able to get through to the second turn without losing a second. Battling a cold, Caesar scratched the rest of her races, but her desire to perform at her best has not taken a step back since signing with CSU Fullerton last month. “It makes me work even harder now that I have a future running in college,” Caesar said. Caesar is the two-time defending ESL champion in 800-, 1600-, and 3200-meter races, and if her run last week is any indication to just how strong her from is, she will raise a third championship in each of those events. Nancy Vasquez held down the long-distance races in Caesar’s absence. In the 3200-meter she finished second place with a time of 12:33.79. It was 12 seconds behind Corcoran’s Brandi Valdez. On the boys’ side Eric Rangel was the only multiple podium finisher. He took second in the 100-meter by a slim margin, and clocked 11.76 seconds. He followed it up with a 23.68 second time, and took third in the 200-meter. Manuel Torres added another third place finish when he ran for 56.86 seconds which gave him a third place finish. However, all eyes where on Lionel Aguayo in the 1600-meter. 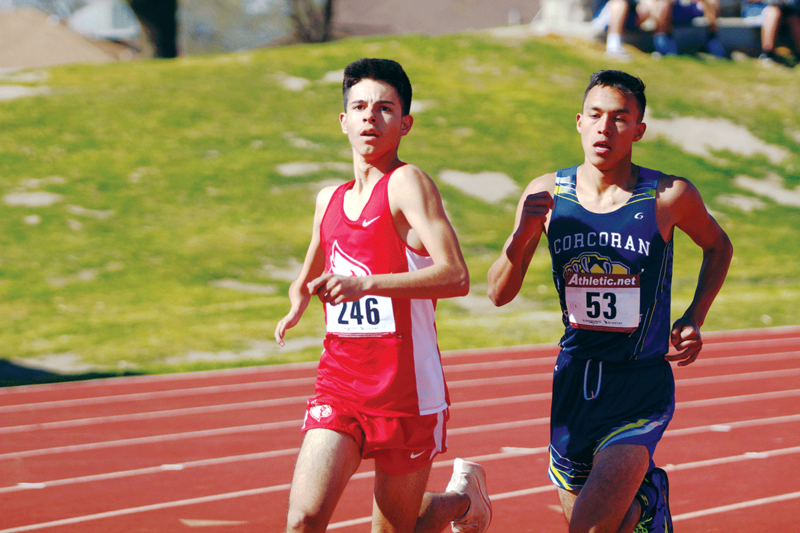 He was in a pack of seven runners made up of all Lindsay and Corcoran athletes, but by the third lap it had dwindled down to just him and Corcoran’s Joe Gomez. On the final turn of that same lap Aguayo overtook Gomez on the outside, and built up a slim lead. “It felt good to be in the lead, and I began to step it up a little bit,” Aguayo said. The time out front for Aguayo was short lived as Gomez retook the lead before the lap ended, and began to build a substantial lead. Aguayo finished in second with a time of 4:47.47. It was less than four seconds behind Gomez. “It was good to go head-to-head with him, but they have some really strong runners,” Aguayo said. More impressive than the podium finishes were the 22 Cardinals who set personal recorders which improved their overall results. Those results led to top three finishes for Lindsay’s boys and girl teams. The boys finished in second with 82.6 points, and girls took third with 68 points.